For some strange reason I have always LOVED split pea soup!. With carrots and onions it has such a wonderful, rich flavor. It is a great comfort food that I don’t get often enough (my children are not fans because it is green). The barley adds a kind of nutty texture that I really liked. I hope you enjoy it as much as I do. Combine the water, bouillon and spices and whisk to combine and set aside. 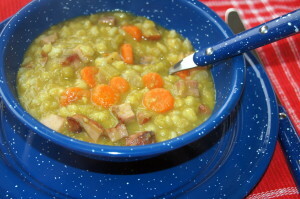 In a 12″ Dutch oven, layer peas, barley, ham, carrots, onion and celery. Do not mix. Pour in the water/spices mixture. Don’t stir! Cook at 300 (14 coals on top and 6 coals under) until the peas reach the desired creamy, soft texture, about 90 minutes to 2 hours. Add new coals as necessary. (This is OK to cook low and slow.) Remove the bay leaf, stir well, and add salt and pepper to taste, if needed. Add water or chicken broth to thin the soup to the desired consistency before reserving if necessary. For some strange reason I have always LOVED split pea soup!. 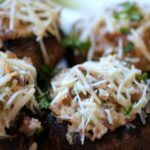 With carrots and onions it has such a wonderful, rich flavor. 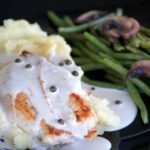 It is a great comfort food that I don't get often enough (my children are not fans). The barley adds a kind of nutty texture that I really liked. I hope you enjoy it as much as I do. 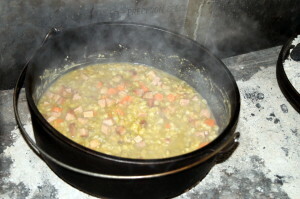 In a 12" Dutch oven, layer peas, barley, ham, carrots, onion and celery. Do not mix. Pour in the water/spices mixture. Don’t stir! Cook at 300 (14 coals on top and 6 coals under) until the peas reach the desired creamy, soft texture, about 90 minutes to 2 hours. Add new coals as necessary. (This is OK to cook low and slow.) Remove the bay leaf, stir well, and add salt and pepper to taste, if needed. Add water or chicken broth to thin the soup to the desired consistency before reserving if necessary.